The scene was a dimly lit spin studio in Calgary where Lynden and her husband were participating in a spin class led by a family friend. Also present was former National Hockey League player and spin class regular, Sheldon Kennedy. At the time, Kennedy was working on the development of the now-open Sheldon Kennedy Child Advocacy Centre, a facility where service providers collaborate to give hope, help and healing to abused kids. During a break in the session, the instructor began talking about Kennedy’s important contributions to kids’ welfare. She picked up the large votive candles that were softly illuminating her bike and placed them on the floor in front of the unsuspecting Kennedy. Lynden says the instructor then asked everyone to raise their water bottles to Kennedy and to the community for coming together to support the venture. Lynden was moved to tears. “I was a sobbing mess.” The experience left her with no doubt that this kind of community support was exactly what Kennedy needed, and what Saskatoon could use as well. It was also a way for Lynden to combine her passion for community and love of fitness. Lynden was born and raised in Saskatoon and is a member of Yellow Quill First Nation. She is an alumnus of the University of Saskatchewan where she competed as a member of the Huskie women’s basketball team from 2000 to 2005. The Saskatoon Police Service hired her in December of that year. After working in patrol in Saskatoon’s inner city for a number of years, she took on a new assignment as a school resource officer in 2010. In spite of the challenges, Lynden loved working in the community and having the ability to build lasting and impactful relationships. As her term in that section came to an end, she began searching for what to do next. That’s what led to her entrepreneurial approach to serving the community. Lynden and her long-time friend and co-owner Bradie Mustoe opened Ryde YXE Cycle Studio on Broadway Avenue in Saskatoon in February 2016. 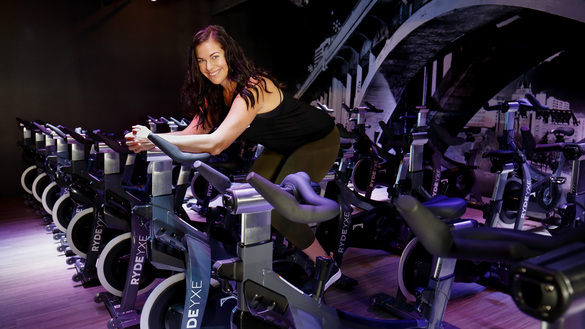 It was the first dedicated indoor cycling studio in the city—the women opened a second location in the City Park neighbourhood in January 2018. Lynden says Ryde prides itself on being a community hub and is dedicated to supporting those who are able to walk through their doors, as well as those unable to do so. Through their many $10 Ryde for Change classes, in which all monies go to a local charity or nonprofit organization, Ryde has contributed more than $50,000, says Lynden. The company is involved in other fundraisers and collaborative events, all aimed at helping the community of Saskatoon. Ryde has given Lynden an opportunity to serve as a police officer and be a good mom while continuing to do good works in her community. As any entrepreneur knows, she says, business is challenging. But it’s also very rewarding.